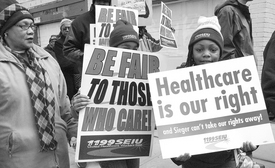 BRONX, N.Y. — Union rights and the right to health care are on the minds of many in this Bronx neighborhood, where 220 health care workers at the Kingsbridge Heights Nursing Home have been on strike since Feb. 20. Picket lines are staffed 24/7, and the workers, who are African American, Latino, Caribbean, Polish, Polish American and other nationalities, are standing firm against Helen Sieger, the home’s millionaire owner. KHNH workers have been without a contract since 2002, and in the past year faced cuts in sick days and holidays. The “straw that broke the camel’s back” was the cancellation of health care benefits in November 2007, at which point Sieger was almost $3 million dollars behind in payments to the union’s benefit fund. Workers are also quick to point out that there are other issues, including overt union-busting efforts, and a long history by the home of unfair labor practices and reneging on court-ordered obligations. That irony of health care workers with no health care coverage has contributed to the outpouring of support the strikers have received, from community residents, elected officials and the families of KHNH patients. Another worker, who started as a scab but quit and joined the picket line after a day, described how he was hired very quickly, without having had required blood or TB tests. Others talked about the hiring of security guards without proper background checks, and neglect of patients. regulatory agencies dealing with nursing home operations.